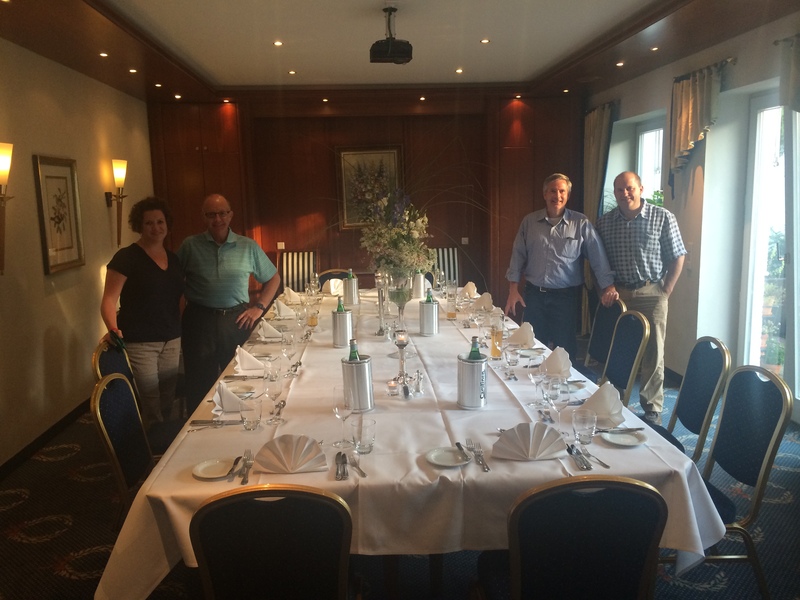 On Sunday afternoon, three colleagues and I left Milwaukee and flew out to Düsseldorf, Germany to attend manufacturing trials with a European customer. 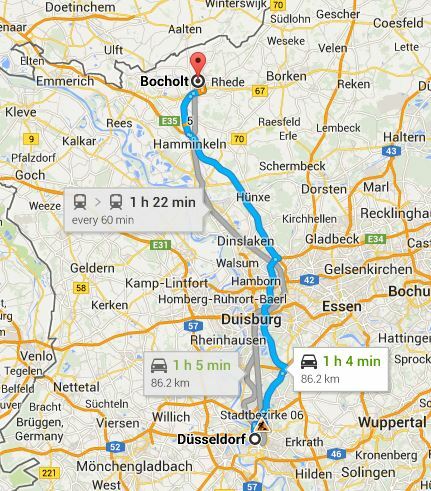 We arrived into Germany on Monday morning at ~7:30AM (local) and drove almost 90 km directly north to the facility in which we’d be working all day in the charming city of Bocholt. Side note: I was quite excited to drive a rented Volkswagen with manual transmission, and on the Autobahn! My first several cars were manual transmission, but recently, I’ve been “stuck” with SUVs with automatic transmission (vehicles which I really love(d), but I do miss the manual transmission). It was fun to be engaged with the vehicle and to drive along the highway at rather fast speeds (at times)! Feeling refreshed, we met as a group of 14 on the garden patio for pre-dinner drinks. I was glad that I chose to start with water (although I was teased a bit for not having had a beer). Our patio time lasted well beyond the time at which we were supposed to have dinner at Siebelt’s inside. The four hungry Americans were the first folks to leave the patio and head to the dinner table (subtle hint to our European friends). The hotel is a charming space, filled with fresh flowers and pleasant staff members. Part of the charm was demonstrated as the gentleman who checked us into the hotel also served as our bartender as well as our maître d’ / head server and photographer. 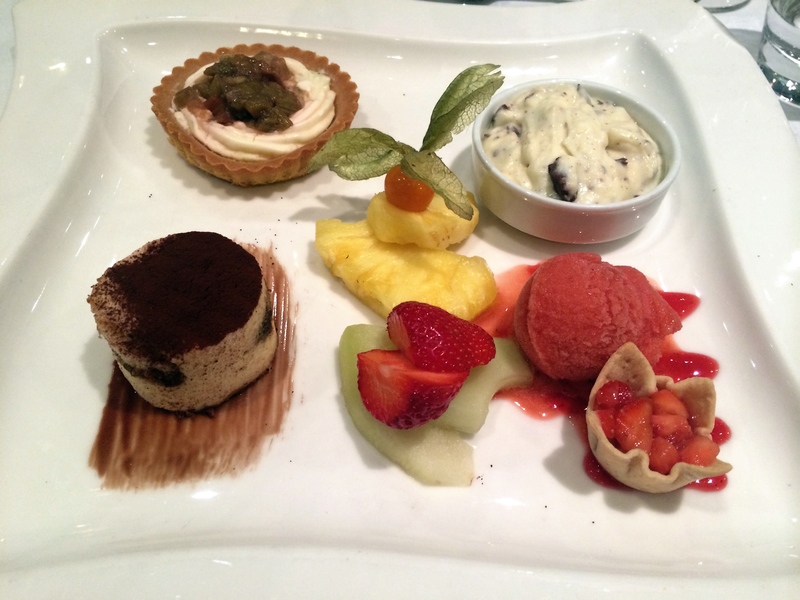 After reviewing the options, I decided that all of the dishes looked quite nice. I advised Ralph, aforementioned “Mr. Everything”, that I was quite hungry, but that I would like him to choose his favorite dish for me. After double-checking that I wanted him to choose and surprise me, Ralph broke into a big smile and said he would be happy to do so. 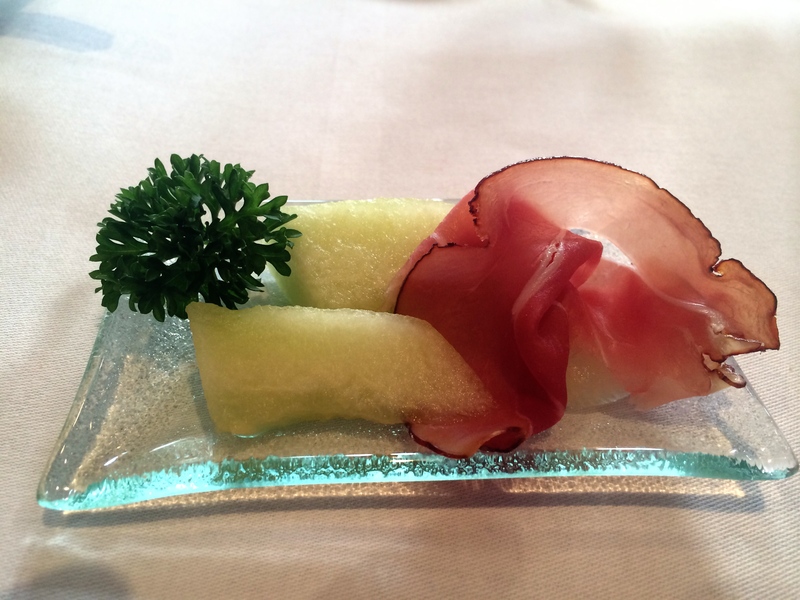 We were first served a “small taste” plate which consisted of melon and prosciutto. 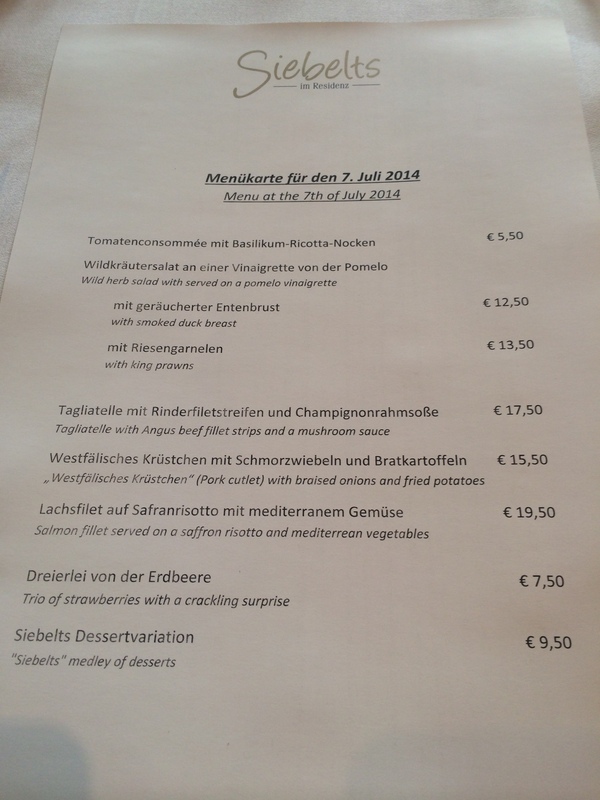 And, of course, we ordered German (and French) wine. Nicolas, whom I have mentioned once or twice before, always takes the lead when it comes to ordering wine. He’s never done us wrong! The first dish Ralph had ordered for me was the Tomaten Consommée mit Basiliken-Ricotta-Nocken (tomato broth with basil and ricotta gnocchi). 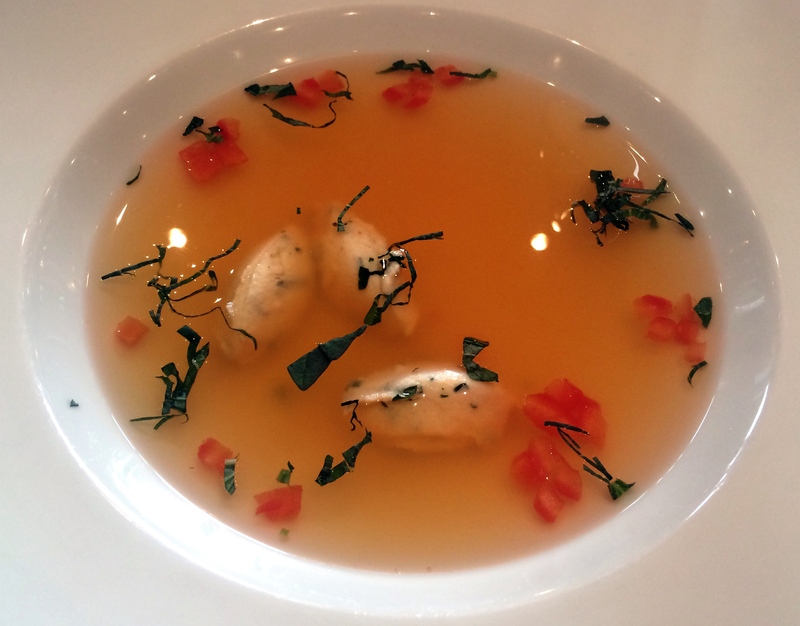 I’ve never had a broth-based tomato soup, so I wasn’t sure I’d like it, but it had excellent flavor, and the few gnocchi added to the broth gave it just enough substance for an appetizer. 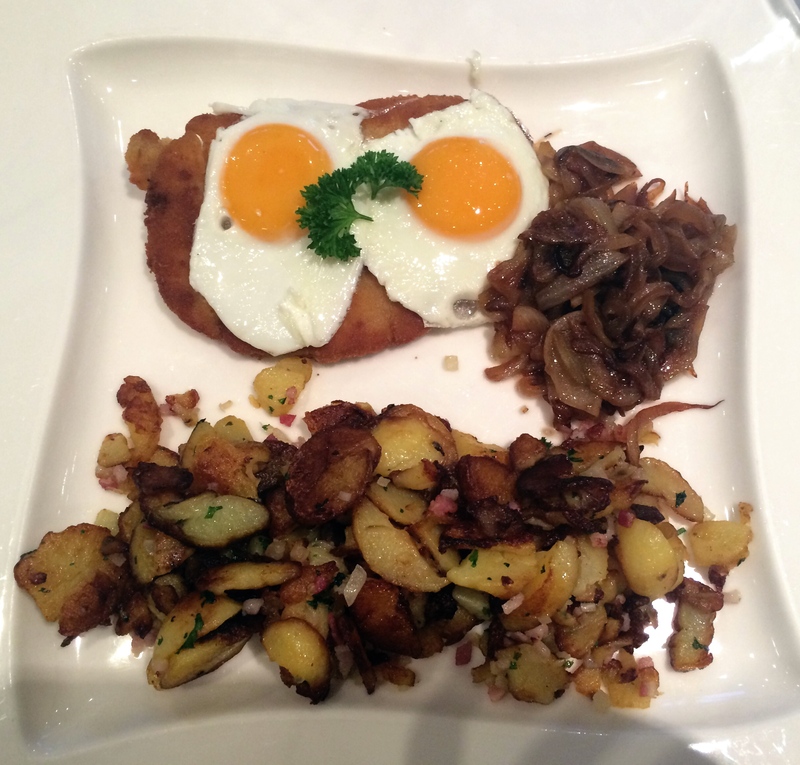 For my entrée, Ralph chose the Westfälisches Krüstchen mit Schmorzwiebeln und Bratkartoffein (pork cutlet with braised onion and fried potatoes). He made sure to mention to me that he chose this dish because it is a very traditional regional dish and he wanted me to experience that (love that!). There is pork under those eggs! The pork itself didn’t have much flavor – a traditional pan-fried crust, but with fried egg, braised onions, and a few dashes of black pepper, I found pork to be really nice. And, the potatoes…those potatoes were excellent! Very full of flavor and nice and crispy. I was laughing with my colleague about the fact that we were essentially having breakfast for dinner, during lunchtime (in the US). It was a lot of food, so I declined to order dessert when asked. I had, however, forgotten that I had turned my meal decisions over to Ralph! When everyone else at the table was served their desserts, I was served the Siebelt’s Dessertvariation (a medley of desserts). Wow! Every bite was so good. I simply couldn’t take more than a bite or two of each. My belly was full! The entire evening was enjoyable. 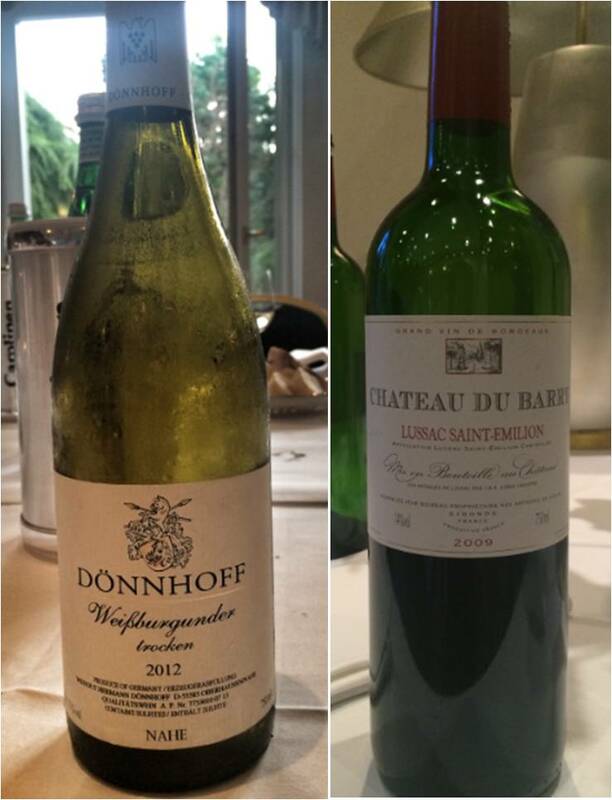 We were a multicultural group, consisting of folks from Germany, the Netherlands, France, and the US, and we had a great time interacting (“talking shop”, talking World Cup, talking food and wine, and talking about this blog!). I was really pleased with how open Ralph was to taking control of my dining experience, and I think he chose very nicely. I felt as though I had experienced the food of the region and had nice variety of flavors and textures. If you’ve dined in this region of Germany, or in Germany in general, I’d love to hear about your experiences! I have to say that after such long travels, that comfort food was just what I needed, Katie! Hit the spot!